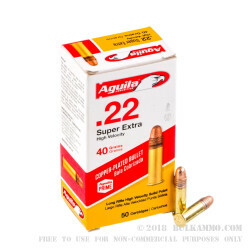 This 22 LR cartridge by Aguila boasts a fast 1,255 fps muzzle velocity, giving it the pep it needs to create a flat trajectory for exceptional accuracy. That suits it perfectly for target shooting and plinking, especially when you’d like to challenge yourself. Ever hit an egg from a couple hundred yards away? If not, this is the round you ought to attempt such a challenge with. 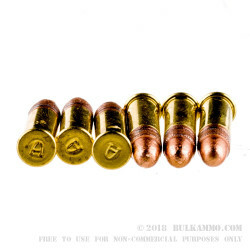 This round has a 40 grain projectile, essentially the standard bullet weight for its caliber. 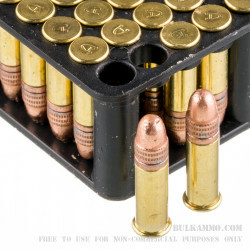 The bullet is plated in copper, which is especially nice for a high velocity load as it’ll keep hot lead residue from caking onto your firearm’s bore. This bullet has a solid point as well, as opposed to a hollow one which initiates expansion during penetration. That makes it less than ideal for varmint hunting, but as a rule a fast moving 40 grain projectile is usually enough to spoil any rodent’s day, expanding or otherwise. 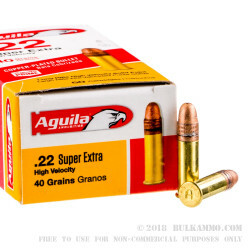 Agulia utilizes their proprietary Aguila Prime technology when they create rimfire ammo, and they test it according to Olympic standards. Thanks to their meticulous production and quality assurance processes, they seldom have trouble achieving their own lofty expectations for their rimfire rounds.